As I was shooting the pictures for this post my wife asked, "Why are you shooting pictures of a pan?" I replied, "You know, as I was washing this I was thinking about what a great pan this is." I elaborated further, but the bottom line is that I decided it was time to spread the good news. 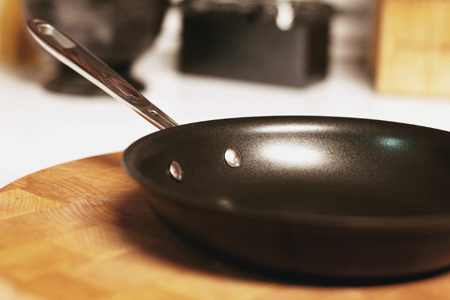 About a year ago I bought this 8" Emerilware anodized non-stick skillet, made by All-Clad. Now, I'm not a huge fan of non-stick cookware, but there are applications where it is simply required. I bought this pan simply because I have been very disappointed with most of the non-stick garbage that is out there. I have other All-Clad cookware and utensils and they have certainly lived up to their reputation for being some of the absolute best cooking products available. They make simply incredible stuff! Take a close look at the picture above. Note that the pan looks almost brand new. This is a testament to how well-made this cookware is. After a year of consistent use, the inside of the pan has barely any evidence of use. The non-stick coating is almost flawless. Not only is this cookware very well-made, it cooks like nobody's business. It heats very quickly, evenly and produces great food every single time. My only regret is that it's only an 8-inch pan. I have a 12" anodized Calphalon pan and it seriously pales in comparison. I plan to remedy that situation very soon. If you need or want some incredible non-stick cookware that will perform consistently without breaking the bank, you can't go wrong with Emerilware from All-Clad. And judging by the metal handle, this baby can go straight into the oven, too. It's time I invested in a new pan, and this may be it. "The hard-anodized cooking vessels are oven-safe up to 450 degrees, but should not be used under the broiler." I have both the 8" and 12" Calphalon pans and they look absolutely digusting and they're not that old. Many thanks for the tip. I'm going out to buy the 8" one this weekend. I tend to stay away from celebrity named product lines because they are often overpriced for the quality you get. But my wife got me a deep cast iron from Emeril's line. I was a bit disappointed when I saw the box since I'm a Lodge man, but it has become my go to cast iron pan for the past two years. I always tell my family and friends to go to restaurant supply companies for their cookware. Most of them are open to retail customers as well. You might have a bit of a hard time finding very small saucepans but other than that, they have standard sizes up to sizes that you would not even think of using in a home kitchen. Their products are commercial quality at half the price. I have found Browne-Halco to be an excellent product. I have 3 of their non-stick frying pans, oven proof handles as the one you have pictured as well, have had them going on 4 years, they are like new. I have the same pan and I love it. In fact, I have a collection of All Clad nonsticks, and one thing I love is its lifetime guarantee. It's true... when the finish wears off after years of use, I email them, let them know the problem and they give me a reference number and an address to send the used pan back to. Within 3 weeks I get a brand new All Clad nonstick for the price of shipping. Really! They stand by their products. Plus I have to add, the way to increase their longevity is to clean it properly (I use baking soda and a nylon brush) and never let it get too hot. I have a whole set of these pans and I agree they are great! I've had mine for more than 3 years now and the non-stick surface is still flawless. Thanks for the review, I certainly need new pans, and I always wondered about the Emerilware, Rachel Ray's stuff, and Paula Deen's stuff too!! On your recommendation I bought this pan and the 14 inch. They really are fantastic!